In FutureGen, oxy-combustion would have been used in combination with carbon storage to capture at least 90 percent of carbon emissions. Oxy-combustion refers to burning coal with a mix of oxygen and carbon dioxide instead of just ambient air. The United States has identified this approach as the least-cost approach to cleaning up existing coal-fired facilities and capturing CO2 for geologic storage. But the continued use of coal in any form is the central problem as its cost effectiveness continues to decline. Coal companies continue to go out of business, but they are not going alone. One industry, sometimes overlooked, that they are negatively impacting is coal transport. With nearly 90 gigawatts of U.S. coal-fired capacity (33 percent of the present total) now scheduled to be retired by 2020 and a 35 percent reduction in coal prices since 2012—plus four major coal company bankruptcies in 2015 alone—industries such as coal barge transport (handling 20 percent of the total) will continue to be dramatically affected by this shift. The process here is a reversal of the economic development multiplier dynamic, which measures the positive impact of new jobs on regional communities. While water transport reductions largely impact inland waterway regions, systemic change is seldom confined, but cascades outwards, often producing unexpected negative impacts at the same time that industries such as renewable power grow. But renewables need only to transport their resulting electricity, which is in a major paradigm shift from coal—an industry that has been a major part of energy production for well over a century. 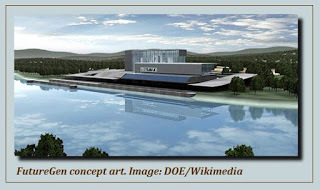 Tina Casey, “No Future For Clean Coal: $1 Billion Plug Pulled On FutureGen,” CleanTechnica.com February 6, 2015. 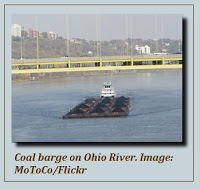 Dale Dupont, “Coal Hard Facts: Coal Movements in US Continue to Shrink,” WorkBoat, October 2015.